Custom computer keyboard labels, also known as keytop stickers or overlays, provide an economical way to customize your work station and increase productivity and efficiency. 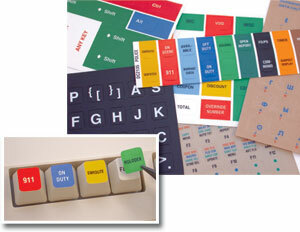 Keyboard and Keypad labels are designed and manufactured to your exact specifications. Labels are made of the highest quality materials including Lexan® polycarbonate and 3M®adhesive. Labels are easy to apply and get a precise fit for any keyboard, keypad or input device. Quick, competitive quotes with design, manufacturing and delivery in as little as one week. Common uses for custom keyboard labels include gaming, specific software, data-entry, language and POS system applications. DataCal has been designing and manufacturing custom keyboard labels also known as keytop stickers or overlays, for over thirty years in Gilbert Arizona. Labels are designed and manufactured to adhere completely to the tops of computer keyboard keys. Custom options are virtually limitless, including colors, legends, graphics and size variations. One of the most popular applications for custom keyboard labels and keytop stickers is in POS systems in retail stores where specific command legends are customized to increase speed and accuracy. DataCal can also create labels in virtually any language, for specific software applications or to improve data-entry. Our extensive experience with both designing and manufacturing custom keyboard labels paired with our utilization of only premium quality materials, produce durable, customized labels ideal for your specific application. Please contact our custom department at 1-800-459-7931.